The steel ribs arching over New York City’s newest transit station have already become a familiar sight for the city’s residents and tourists. Now, after seven years of delays, the striking new World Trade Center Transportation Hub will finally open this month in Lower Manhattan. When the Twin Towers fell during the 9/11 attacks, the train station below that housed the subway and New Jersey rail was also destroyed. A new station was proposed to help restore vital transit connections for the region and create an awe-inspiring architectural centerpiece to the redeveloped World Trade Center Memorial Site. Passengers can now enter into what is a cathedral-like space that allows natural light to filter down onto the commuters below. 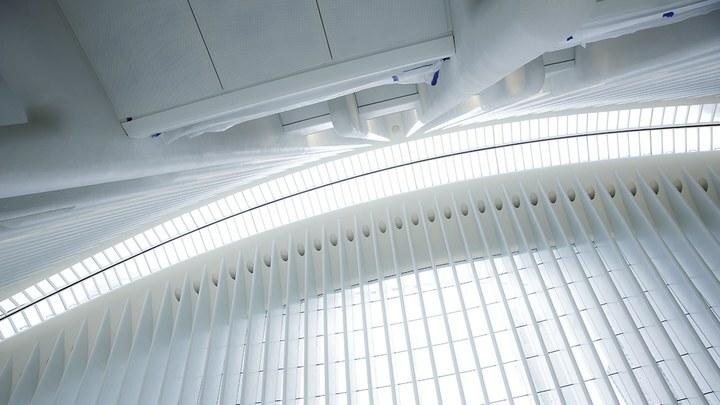 The station also has a giant skylight, named The Oculus, which will be opened on warm days and every September 11, turning what might have been a dark, crowded hallway into an open-air public plaza. The Hub was designed by Spanish architect Santiago Calatrava, who is known for similar soaring white structures… and soaring budgets. The project took about twice as much time and twice as much money to complete, for a total cost of $4 billion. When complete, the Hub will be the most expensive train station in the world, with a corridor below it that is widely considered to be the most expensive hallway on the planet. The station cost even more than One World Trade Center, the new tallest building in the US, which is right next door. Regardless of all the budgetary issues—or perhaps because of them—the World Trade Center Transportation Hub is a breathtaking space. Can You Guess How Much NYC Paid the Architect of the Most Expensive Train Station on Earth?